This is my report on information that caught my attention at the CFA Institute Wealth Management Conference. You can also read my post on Scott Welch’s presentation about client reporting or participate in the conversation about how to help clients deal with market volatility. Muni market changed after bond insurers blew up in 2007, making underlying credit more important. Puerto Rico is almost locked out of the muni market now. Its bonds are owned heavily by single-state funds because of its special tax status as a commonwealth. Municipal defaults are more common–36 times more common–than reported by rating agencies. EMMA is building a new muni bond market and it’s 10 times better than EDGAR. Social media is bursting with #muniland discussions. Advisors, think about ALL taxes, not just income taxes. Interesting factoid: The 35% tax bracket is incredibly narrow for singles–$398,351-$400,000. Estate tax’s portability between spouses is a big plus. Canadians hit top tax rates really fast. When one spouse is a U.S. citizen and the other is Canadian, taxes are complicated. Gifting asset to Canadian spouse can be advantageous for U.S. spouse. Canada has no gift tax regime, but it has an attribution regime with rules around income splitting. About 5,000 family offices exist, many under the radar. The average family office fee is 40 basis points on assets under advisement. Fees start at 75 basis points and go down to 25 basis points. But families don’t like fees calculated in basis points, so some family offices are looking to charge flat fees. #1 concern for wealthy family is how to transfer wealth to children and educate them to be socially responsible. Providers aren’t spending enough time on that. Family offices typically don’t have scale to offer everything clients want. Therefore, they are outsourcing where the family doesn’t require control. Family offices haven’t adapted to the mobile/digital style of younger generation. They don’t want paper and they believe in communities, not committees. “Insourcing Private Investments–Outsourcing Public Investments,” which means investing directly in private companies because private equity fees are too rich. Investors take board seats and have a say in the company’s direction. Investors are “barbelling their equity portfolios” for heftier returns. This means low-beta investing combined with investing in asset classes such as micro caps, small caps, and emerging market stocks. Taking on more risk in fixed income for higher yields. Moving against inflation by minimizing duration to about 2.5 years and investing in asset classes that move up with inflation, such as real estate and broader baskets of commodities. Taking an institutional approach to cash management, laddering it instead of using money markets funds. “Cash management/laddering may offer opportunities for this audience,” said Fay. Look at groups such as the Cleveland Area Family Exchange for your networking and marketing. Look for trusted people in your community who can make your practice more holistic. More family are clubbing up with other families to make direct investments. I believe that a video recording of this presentation will be available. Watch for it! You are almost invisible to the next generation if you’re not on social media. Don’t have an intern do your social media. Five years ago, digital social was 19% of marketing spend, now it’s 38%. There’s no more mass marketing. Now it’s targeted. Investors need to rethink fixed income investing in terms of the need to 1) generate yield, 2) insulate or protect portfolios if interest rates begin to rise suddenly, which would have a prolonged negative impact on portfolios. Alternative credit strategies are underexploited, with less than $500 billion in assets under management vs. $2.4 trillion in traditional fixed income and $832 billion in extended credit sectors. Paul Bouchey, CFA, managing director of research, Parametric Portfolio Associates, got to something I’d been struggling to explain recently: Why do low-volatility strategies outperform? Bouchey explained it’s because of better compounding for the geometric returns. I wish I could show you his graph. It’s impossible to do justice in words to this presentation by Carl Richards, founder of The Behavior Gap. For a hint, check out his sketch summarizing the conference’s tax presentation. The CFA Institute has collected some of the best tweets about the conference. My personal possessions aren’t as neatly organized as my writing, so I’ve worked with several professional organizers. They’ve taught me a lesson that is critical for folks who write market, economic, or portfolio commentary: Put like with like. Just as I should keep my overabundant collection of sweaters in one drawer, rather than scattered over all of my dressers, you should organize your commentary topics in a logical manner. This isn’t easy when you’re an investment professional who is under pressure to churn out commentary at a quarter-end, right when you’re busy with other quarterly tasks. How does this translate into quarterly commentary? For example, you might separate commentary into sections on the economy, stocks, and bonds. I imagine many of you already do this. However, you can take this one step further. Use some sort of organizing principle within each section. For example, don’t dump economic statistics in any old order. Consider dividing them into positive and negative indicators, or employment, manufacturing, and income statistics. This kind of organization makes it easier for your reader to grasp your message. Organize your information well, and you’ll make it as easy for your readers to find your message as it would be for me to find my navy blue cardigan if I divided my sweaters into cardigans vs. pullovers and then sorted them by color. Talk to your mother before you use financial vocabulary in your communications. That’s one message I took away from “Guide to the Markets” presented by Andres Garcia-Amaya, a vice president with J.P. Morgan Funds, on September 29, 2012 at FPA Experience 2012 in San Antonio, Texas. Garcia-Amaya recalled discussing the “fiscal cliff” with his mother. My paraphrase of his comments follows below. G-A: Mom, what do you think about the fiscal cliff? Mom: Oh, it’s so scary. G-A: Mom, do you know what the fiscal cliff is? Mom: I have no idea. Bottom line? Don’t assume your clients and prospects are familiar with financial vocabulary. Test your communications on members of your target audience. Avoid technical terms or explain them briefly. Garcia-Amaya’s presentation focused on markets, not his mom or communications. He made the point that financial risks and bad news create opportunities for long-term investors because they depress valuations. Also, as Garcia-Amaya noted, $10 trillion is sitting on the sidelines. That’s bigger than the $9.7 trillion size of the entire U.S. mortgage market. When those funds flow back into the market, they should boost prices. Emerging market debt–The emerging markets’ real gross domestic product (GDP) is growing and they have low net debt-to-GDP ratios. What about YOU? Do you have a brief explanation that you prefer? https://www.investmentwriting.com/newsite/wp-content/uploads/2012/09/cliff-1845586_1920.jpg 1281 1920 Susan Weiner, CFA https://www.investmentwriting.com/newsite/wp-content/uploads/2016/12/investmentwriting_logo_2016.png Susan Weiner, CFA2012-09-29 20:32:222017-06-01 11:30:13Your mother and the "fiscal cliff"
Reader challenge: Your favorite tool for investment commentary? Investment commentary is a key component of client communications for many asset managers and financial advisors. Having the right tools can make your life easier, so let’s share information about them. What’s YOUR favorite tool for creating commentary? Please share your top choice in the comments section below. Any kind of tool is fine. For example: writing book, commentary template, data source, investment strategist, website, data source, software, or company. My favorite tool is mind mapping because it helps me organize the information I collect from interviews when I ghostwrite investment commentary. I use mind maps to find and organize the most important information. I’m looking forward to learning about YOUR favorite tools. https://www.investmentwriting.com/newsite/wp-content/uploads/2013/03/READER-CHALLENGE-2.jpg 111 223 Susan Weiner, CFA https://www.investmentwriting.com/newsite/wp-content/uploads/2016/12/investmentwriting_logo_2016.png Susan Weiner, CFA2012-09-18 07:05:532015-09-04 11:01:54Reader challenge: Your favorite tool for investment commentary? Can you recommend sources of market commentary with wit and wisdom? This request from a reader inspired me to ask my social media colleagues for suggestions. Below you’ll find a list of other people’s suggestions. I credit the source in brackets when they gave me permission to name them. Some of the commentaries were recommended by their writers or someone working for their firm. Still looking for more ideas? Check out the commentaries at Advisor Perspectives. To see what others like, click on the link to the most popular commentaries. Did we miss any great sources of market commentary? Please mention any other great market commentaries in the comments below. Thank you very much, all of you who so generously contributed to this list. Poll: When can’t you replace “headwinds” in your commentary? Is there any time you can’t substitute “challenges” for “headwinds” in investment or economic commentary? When I posed this question on Twitter, Justin Smith of Jonathan Smith & Co. sent a tongue-in-cheek tweet about one situation in which it’s okay to use headwinds. What do YOU think about headwinds? Headwinds has a long history of use in our industry, so I won’t be surprised if many of you vote to continue using it. Please answer the following question in the poll in the right-hand column of my blog: What is the best substitute for “headwinds” in market or economic commentary? https://www.investmentwriting.com/newsite/wp-content/uploads/2013/03/Whats-YOUR-opinion.jpg 153 280 Susan Weiner, CFA https://www.investmentwriting.com/newsite/wp-content/uploads/2016/12/investmentwriting_logo_2016.png Susan Weiner, CFA2012-07-21 18:12:522015-09-04 11:29:20Poll: When can't you replace "headwinds" in your commentary? Reader challenge: Can you explain duration better than The New York Times? The duration of a bond isn’t easy to explain in few words . This is why I was delighted by the brief description I found in The New York Times. Author Carla Fried wrote, “For the most part, managers seem to agree that it is best to limit a fund’s duration, or sensitivity to changes in interest rates. 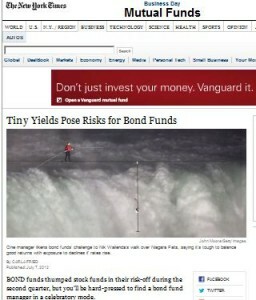 The longer the duration, the more yield you get today, but with the trade-off of a bigger price decline if rates rise.” This paragraph appeared in “Tiny Yields Pose Risks for Bond Funds” on July 8, 2012. Can YOU explain duration better? I’m interested in alternative explanations of duration that an ordinary American can understand. Please leave your suggestions below. https://www.investmentwriting.com/newsite/wp-content/uploads/2013/03/READER-CHALLENGE-2.jpg 111 223 Susan Weiner, CFA https://www.investmentwriting.com/newsite/wp-content/uploads/2016/12/investmentwriting_logo_2016.png Susan Weiner, CFA2012-07-09 08:06:132015-09-04 11:32:45Reader challenge: Can you explain duration better than The New York Times? If you’ve ever worried whether to use “which” or “that” you’re not alone. It took me years to figure out. 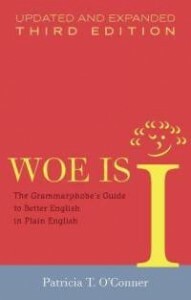 However, Patricia O’Connor lays out the rules nicely in “The Which Trials” section of her book, Woe is I: The Grammarphobe’s Guide to Better English in Plain English. Here are O’Connor’s rules from page 3 of her book. If you can drop the clause and not lose the point of the sentence, use which. If you can’t, use that. A which clause goes inside commas. A that clause doesn’t. Which is proper in this sentence because the following sentence makes sense: “The carrot is 1% financing for your banks.” Mauldin properly places a comma before the start of the which clause. Here’s a Mauldin sentence that properly uses that: “Will those lines look like the one that Colonel Travis drew with his sword at the Alamo, where those who crossed and joined him knew their fate?” A sentence consisting only of “Will those lines look like the one?” doesn’t make sense. Thus, that is required. You’ll find more on these rules in “Which Versus That” by Grammar Girl Mignon Fogarty, one of my favorite online grammar resources. For a more technical explanation, see “Introduction and General Usage in Defining Clauses” on the Purdue Online Writing Lab site. I recommend O’Connor’s Woe is I as a fun read. Plus, you may learn something from it. I know I did. I’m glad I learned about it from a post on the Copyediting Facebook page. https://www.investmentwriting.com/newsite/wp-content/uploads/2016/12/investmentwriting_logo_2016.png 0 0 Susan Weiner, CFA https://www.investmentwriting.com/newsite/wp-content/uploads/2016/12/investmentwriting_logo_2016.png Susan Weiner, CFA2012-02-28 05:23:432016-12-27 16:12:12"The Which Trials" according to "Woe is I"
Quarterly investment letters are central to many asset managers’ communications with their clients. That’s why I’m asking your help in defining what makes them great. Please answer my six-question survey (NOTE: I’ve removed the link to this expired survey]. I’ll report on the results in a future blog post. 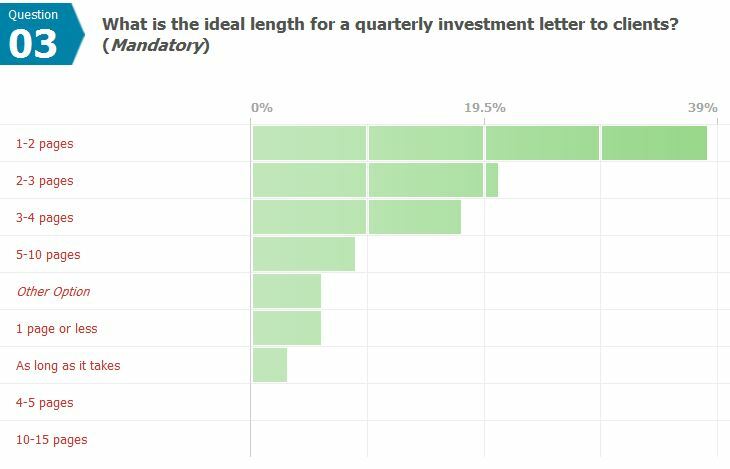 The responses to this “one word” question inspired this survey. I feel fortunate to belong to this community. Thank you!